The Longeneckers think birthdays ending in 5 or 0 are special. 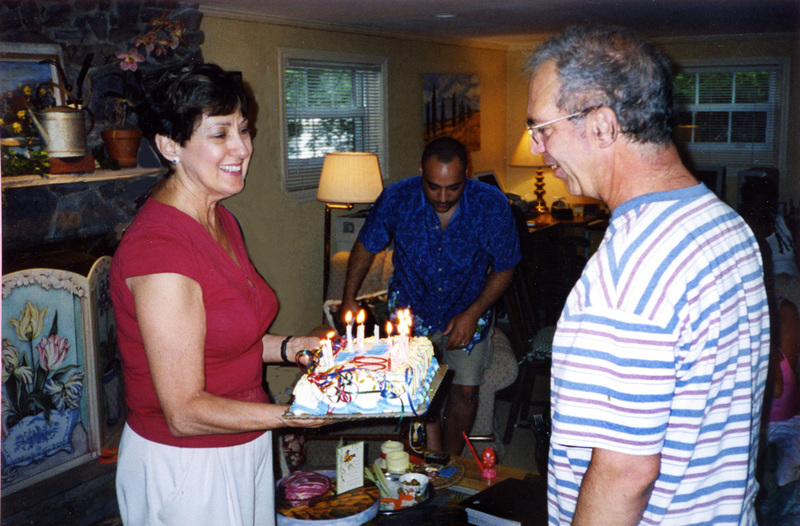 At a Longenecker family gathering in Florida in 2003, we celebrated the birthday of my brother Mark, who turned the big 5-0. And also of my Aunt Ruthie who celebrated her 85th birthday at our house at the same time. 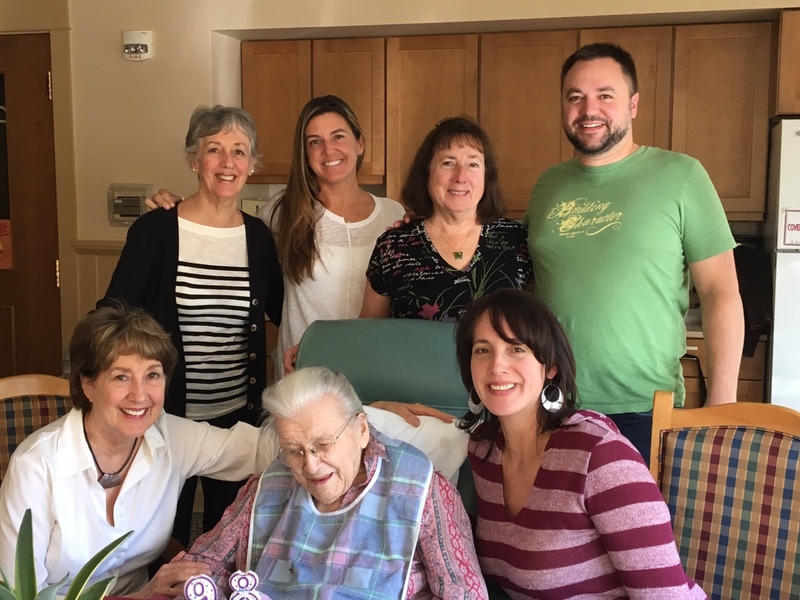 This month on October 4th, Ruthie reached her 98th birthday. That called for two celebrations: one among residents of the home where she receives nursing care and the other with her family at the same facility. It came suddenly and it left the same way . . . 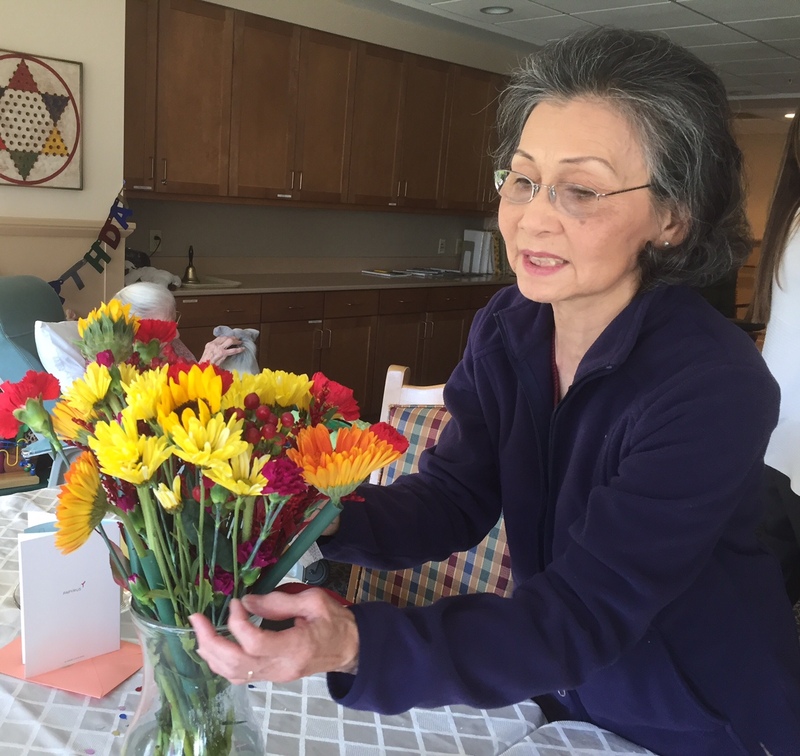 The preliminaries: Tao from Viet Nam, one whom Aunt Ruthie sheltered as a young woman, beautifies the table with an autumn bouquet. Her children think of Ruthie as their grandmother. Then – family meal with dessert . . .
No 5’s or 0’s appeared on the birthday cake in front of her, but there was a huge number 9 in the calculation – not 98 candles, but close! She didn’t have enough wind to blow out the two candles at first. Neither did I. We all sent her good wishes after 4-5 puffs, extinguishing the two flames. 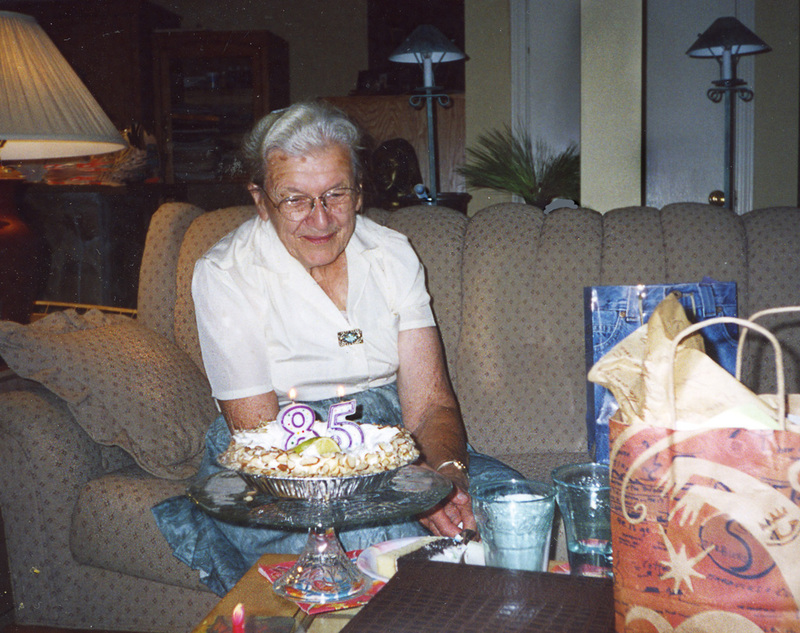 I promised to give you a postscript to my post Aunt Ruthie Longenecker: Her Life in Pictures. Earlier in the week, Ruthie with her perky pony tail leaned in, looked intently at my computer screen with eyes wide open. When we came to the vintage photo of the 1930s family reunion, she began identifying a few relatives she remembered – her aunts, uncles, her father, her mother (“My, she was thinner then, if you know what I mean,” she said with a wry smile, viewing her mother.) Her left hand moved steadily if quavery across the family photo – speaking names of relatives long dead: “Grandma Martin, Grandpa Sam, Uncle Frank, Uncle Joe, Mattie, Bertha, oh, and my brother Ray.” Long pauses often punctuated the name call. I was thrilled to observe the foggy memory mists lifting and blowing away for a few precious minutes . . . Remember my promise on the October 5 post? I did show her the post of her life in pictures, including your comments. They made her smile, smile real big! Given a choice, what age would you choose among the ages you’ve been? Previous postHeart on Fire: Guess Who’s Voted for President! Oh my, Marian. What a wonderful post! I’m so glad your Aunt Ruthie had such a wonderful birthday, and that you were able to share your previous post with her. Thank you, Merril. I look forward to Wednesdays when we can chat here – you, obviously, starting our conversation first thing in the morning. More energy and a younger body would be my wish too. You said it perfectly: “I want to be the me I am now at every time as I live it.” No need to look backward – I’ll stay in ‘forward’ gear too. Great photos, Marian. I agree that you both look great. The reward of loving is truly living your life. Living and loving go hand and hand in the best of families. I am honored and humbled to share in all this with mine. Thank you, Shirley. Marian, your blog is such a gift. As I read and view your images, it reminded me of similar episodes with members of my own family. Thank you! I’m so glad that my writing sparks memories for you. That’s the whole point – glad this post jogged happy thoughts, Lynn. Such a lovely post and photographs Marian thank you. A lovely sharp and rye comment noting that the women outnumber the men! How lovely that she named and saw the vintage photos. I love her comment, ‘she was thinner then if you know what I mean’ 🙂 And to share the birthday comments with her. There is joy and happiness in the photographs that have me smiling! Tao – what a lovely name and clearly a lovely person ..
Susan, I have mentioned more than once that Aunt Ruthie suffers from memory loss but the part of her brain that cooks up clever comments is still alive and well. Though she is fading, we continue to enjoy her. I’m glad this post spoke to you, Susan. Thank you! What beautiful pictures of you and aunt Ruthie two and Mark. Janice Jean and the kids also look beautiful. I had to go back to see aunt Ruthie’s post. I hate when I miss one of your posts. I feel as if I missed a lot. Aunt Ruthie is lovely and fun to visit. She can remember the past. I love asking her questions. She amazes me that she is always happy. I have to get to Pennsylvania. I love my life in my now. I too would love the strength in my knees because energy I have a lot of. Which I praise God for. Thanks for all the positive comments here, Gloria. I was thrilled when you said: I love my life in my now. That is a goal for me every day: gratitude and joy! You’re welcome, Anita. She was thrilled and so were we to share this highlight of her life, her year. She is the last leaf on our family tree in this generation. You made her day. She looks comfortable, happy and comforted. So sweet the story of her Vietnamese “daughter” and her “grandchildren”. I’m sure they love her deeply. If my foster parents were still living I would be visiting, too. When I first met you, you mentioned your early life and this comment brings it all back. You are inspiration moving from R.N. to now – prolific author. I hope someone in your extended family can acknowledge your accomplishments. I do! Awww….you’re so sweet. My dad was a real gem. We reconciled in my young adult life. I sure do miss him. I still have a world of cousins I grew up with. They are closer to me than my sisters. Your dad, your cousins – your writerly connections – you have a tribe, Susan. I don’t remember all Ruthie’s comments, but every time I haul out my computer, she remarks, “Oh, all the new-fangled stuff they come up with these days” or something to that effect. When she saw the 1930s family reunion picture, she was transfixed. A lot of words weren’t necessary as she perused the photo. Blessings to you too, Darlene. As Oprah would say, you are living your best life, Jill. I’ll stick with mine too – wouldn’t want to go through the hard stuff again and the happy times I can cherish in memories. Thanks a bunch! Marian, this is wonderful and I agree, you both look fabulous. It must be genetic!😊 What a special celebration of precious past and present moments for Aunt Ruthie and her family. Thank you for sharing. Thank you for following our family’s antics here, Kathy. I’m glad I could make the celebration. Hurricane Matthew hit and two days later I was on a plane leaving behind a house with a hole in the roof and lots of debris. Roofs can be repaired but family celebrations can’t wait – especially at age 98. Loved the quote by Madeleine L’Engle at the end of your post! I also loved what your aunt said about the women outnumbering the men! That wry sense of humour, that little sparkle shows us their real self is still there, but just resting a lot more! By the way, I was able to post my comment on your last blog. Here’s how: I typically use Safari as my browser, but when I switched to Google, the comment appeared. I hope you saw it, Elfrieda. Your family and mine definitely agree on specially celebrating all the birthdays ending in 0 and 5, Marian, but I’m pretty sure we also doubly-celebrate any other birthdays when the family can all get together, too! 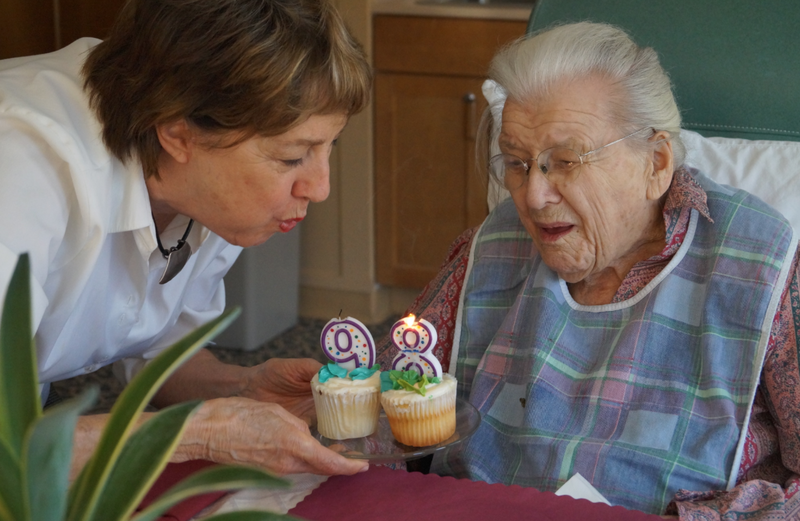 For my mom’s 98th birthday we got the 9 and 8 candles put them on cupcakes, and she was most interested when we lit the candles, so we had to be very careful. I’m sure you posted a photo of the 9 + 8 celebration. “Never miss a party” is our mantra. When we come to PA from time to time, we stay in Ruthie’s house and as I was looking for clean dish towels last week, I spotted the 8 + 5 candles I bought (and she kept) from the party 13 years ago. I’m saving the 9 + 8 and I think you know why. 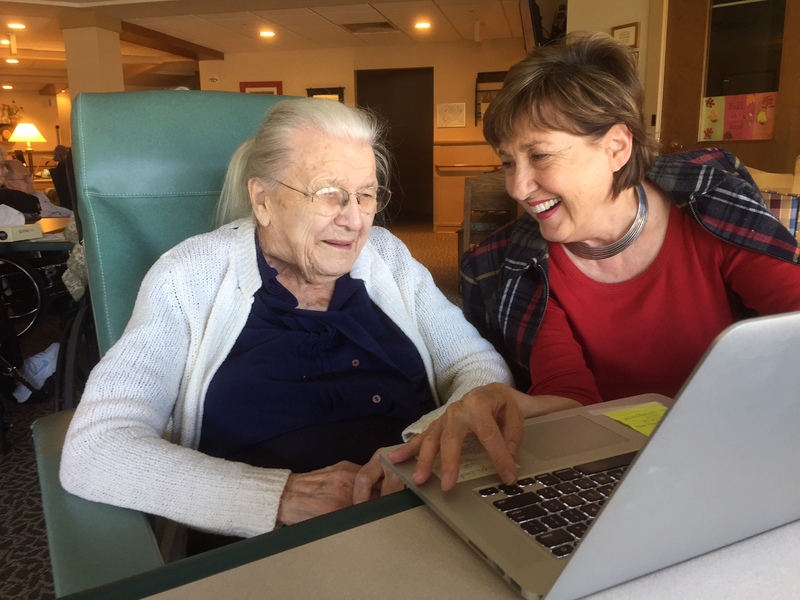 Marian — I love, absolutely love, the captivated and smiling expressions on your Aunt Ruthie’s face as she looks at your laptop. She is precious! I adore being 59, but I would go back to age 32 for a brief moment so I could hug and kiss my mom one more time. Oh, Laurie, you lost your mama so young, but I suspect her attributes live on in your vivacious spirit. How she would cheer you in this book launch. Between you and Joan (Rough) there is a lot of hoopla this fall, and it gives me goose bumps to be part of the celebration. Love your pictorial birthday history of Aunt Ruthie. I feel like I’m part of the family. My favorite age so far is 50. Empty nesters, fit, fun and exploring new adventures. What a compliment – Since you are a sister/friend, you are part of the family. Age 50 sounds like a good balance: Like the fulcrum on a seesaw, one can see both behind and before, with enough wisdom and energy to navigate the rest of the way. Thank you, Carolyn! A lovely celebration for a special lady! Thank you for following our family – through days of celebration and otherwise. I appreciate your always checking in here, Fiona. Thanks for the update on Aunt Ruthie. I actually got tingles up to my scalp, looking at the photos of her birthday party, and then her hearing the comments of your readers. What a gift she has given to all of us. She shows us the value of aging (sometimes I think I don’t want to ‘get that old’) and how to do it with grace and charm. Oh, and Madeleine L’Engle – one of my favorite writers of all time. Have you read her journals? The Summer of the Great Grandmother stays in my mind even though it’s been decades since I read it. Aunt R. lives in what amounts to luxury for the elderly. However, whenever we leave the facility, my sisters and I chime in together, “I don’t think I want to get that old!” But who knows, we aren’t there yet, so how can we know for sure? I don’t want to be a crotchety old lady – grace and charm are way more appealing. No, I haven’t read Madeleine L’Engle’s journal though I admire her style in other works.. I just checked on our public library website and can’t find it there. So . . . I guess I’ll have to order from Amazon or Goodreads. Thanks for the tip, Pamela! What an amazing lady your aunt is . 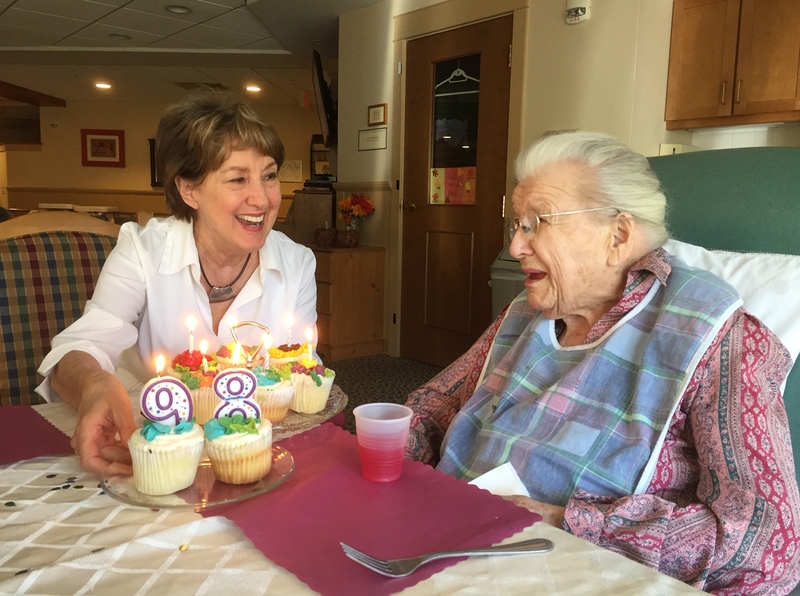 So lovely to see her birthday celebrations …98 wow . For me it has to be 14 when I was a teeny boppa and was madly in love with The Bay City Rollers , don’t know if you remember them . It was a time of joy and belief in anything possible . My friend and myself ran away from home to join The Rollers at Birmingham airport …we had a bottle of water , a couple of pairs of knickers and a chocolate bar between us . We were away half an hour and weren’t even missed 😂😀 I think home and supper beckoned don’t you . Your writing always sounds like you’re right there beside me talking face to face. I agree, a bottle of water and a chocolate bar only takes you so far. You are hilarious, Cherry! I’m glad you enjoyed (vicariously, of course) the birthday celebrations. Next thing you know it’ll be Hallowe’en, a holiday Aunt Ruthie observed at school with a fun house basement and students wearing goofy costumes. Birthdays with 5 or 0 are milestones for sure but your auntie’s look of joy was worth an extra celebration. Thank you for the update. I enjoy hearing about your warm and loving family. That’s the thing about (most) Mennonite families: deeply rooted and intertwined. Yours a case in point. Thanks, Luci! Thank you, Marian. I love this tribute to Aunt Ruthie. I love that she could look at the computer screen and identify people from her past. I see her smile and her left hand preparing to point. She looks so pleased. You are absolutely radiant. The love shines through and I feel part of it. I’m grateful Aunt Ruthie is surrounded by all those loving (mostly) women..
I’m glad you feel part of this tribe as I feel about yours. Novelist Jane Howard has written about the necessity of tribes as has Seth Grodin. When I started this enterprise over three years ago, I had no idea I would feel such a camaraderie with other women, mostly writers. 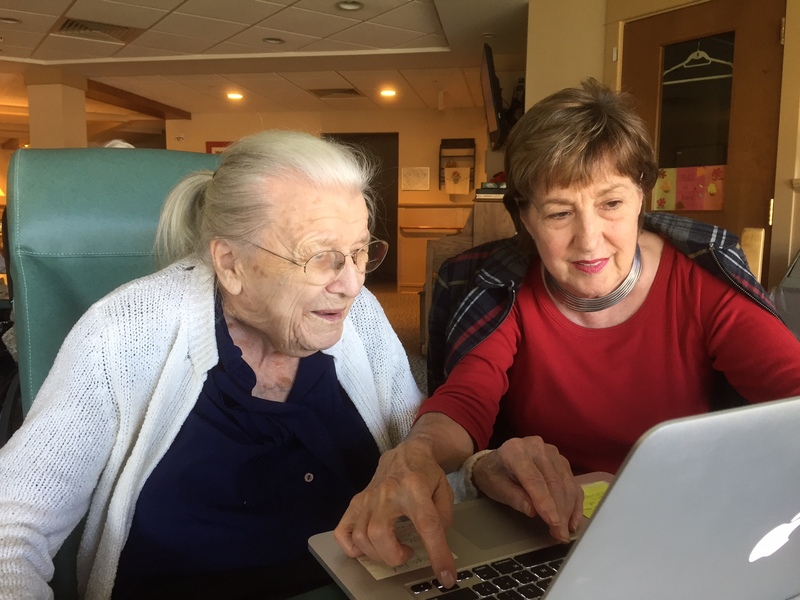 Aunt Ruthie is in hospice care now, but the art and music therapy along with attention from these volunteers, are placing a halo on this phase of her life. So thankful for all of this! What a beautiful post and to be able to give your aunt a tribute while she is still able to enjoy it is super wonderful. Probably the main reason I’m blogging here and writing memoir is to leave a legacy like you. Also like you, I am ascending the ladder of the seventies. The best decade, don’t you think?